This topic is one that I got the idea for from an episode or two of Extra Credits. Specifically from episodes 1 and 2 from Season 5 and episodes 4, 5, and 6 from Season 6. I love their work, and you should go check them out at their YouTube page. I'm going to be looking at the way choice is handled in video games through the lens of two games that I think are some of the best examples of it, while they still handle it very differently from each other. These games are The Walking Dead and Spec Ops: The Line, the games that are easily at the top of my list for the best game of last year. As we're discussing the central mechanics of these games, be aware that some minor spoilers will be unavoidable from this point on. However, I'll do what I can to keep the major plot points out of this. Now, these games are both very dependent on their respective choice systems. They both use their mechanics to drive a point about choice home to the player; a point so fundamental that it is impossible to miss. 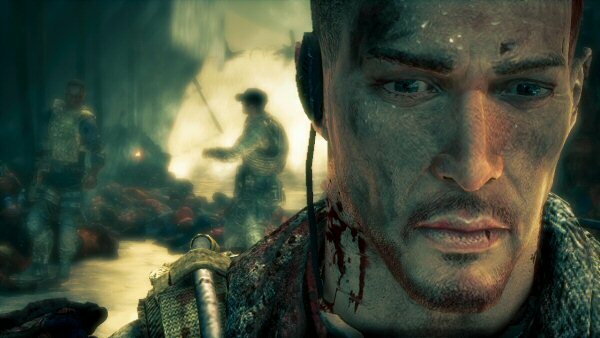 The point that Spec Ops is making is that you have a choice. Even when it seems like you have no options, you ultimately get to choose. The Walking Dead, on the other hand, tells the player that sometimes, you have to make impossible choices in an instant that cannot be undone. Curiously, both of these games had similar effects on me. The first few choices were painful. They really hurt me. I was invested in these characters already, so having to choose what Lee or Cpt. Walker would do put real emotional strain on me. Unlike games with a distilled morality system (i.e. paragon vs. renegade in Mass Effect), I was not making the choices that I did out of a sense of "Oh, this is clearly the good thing to do here." The choices are far more "grey" in these games than in that type of system (and thus they seem more real). However, that also lends itself to me making choices not with thought to the video game's reward system, but to making the choice that I thought was best for the character right then. You see, both of these games would often put a time limit on your choice. The Walking Dead pretty much always did, no matter the importance of the choice, but Spec Ops did from time to time as well. Having a deadline to face is really something. When you only have 5-10 seconds to decide whether someone will live or die, it is an entirely different experience from when you have unlimited time. I'm not very good at snap decisions normally, but while playing The Walking Dead I found that if I have to choose, I will. And that choice may not be the one that I would have expected me to make. You can see the timer counting down. You find out very quickly in The Walking Dead that all of the major choices involve choosing between two people: you choose who lives and who dies. At one point in the game, you are holding onto another survivor. If you let go, you can escape, but he will die. If you keep holding on, you may be able to save him, but you may also die, and he will only slow you down. The zombies are closing in, and you have to choose. If you had asked me what I would choose to do, I would have said without a doubt that I would hold on and try to save him. But that's not what I did. I let him go, and I ran. I let him die so that I could live. Why did I do that? I wonder. There were a lot more circumstances surrounding that incident that the simple setup that I just explained. Perhaps it was because he had said that it was alright for me to let him go. He had accepted his death. But I don't think that's why. In movies, the hero always ignores those death wishes and saves everyone anyways. Perhaps it was because he had recently been proving to be more of a nuisance and hindrance to the group than an asset. He had almost caused a couple of the other survivors to be killed, and he wasn't very useful. I do actually remember considering that fact while making the choice. Perhaps it was because I simply wanted to survive. I wanted to get back to camp, to see Clementine again. I couldn't die there, because I needed to protect her. And yes, I do mean to say "I", not "Lee." The game does a fantastic job drawing you in. The other characters may have been calling me Lee, but he was me. The choices that he made proved that. 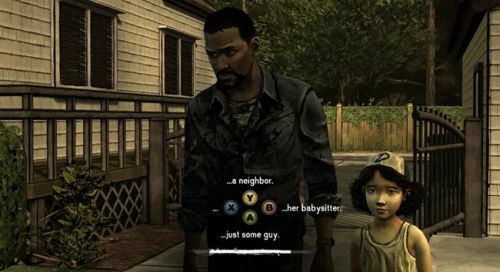 I was the one looking after Clementine, not a character that I was simply watching. I don't think that I've ever felt as connected to a game. The Walking Dead uses an auto-save system, and they always make sure to have a save point immediately after every important choice. After you make your choice, it's final. You cannot go back and load the last checkpoint if you don't like the consequences. You have to live in the world that you build. Now, seeing as the game is basically an endless series of choices, it doesn't do it after every choice; only the major ones. But the fantastic part is what happens when you are in conversation with someone and choose to reveal information to them, or you try and avoid their question, or you give them food... A little notification pops up on screen saying "You choose to be truthful to Larry. He will remember that." He will remember that. Those are powerful words. It really makes it seem like the game is exactly personalized to you. Now, I've only done one play-through of the game, but from what I've seen and heard from others, the game really isn't all that different depending on your choices. Certain characters will still always die, no matter what path you take. But that isn't what matters. What matters is that it feels like there is an endless number of possibilities. Perhaps if you had been nicer to her, she would still be alive. Maybe if you had explained the situation better to him, you could have avoided this whole mess. The possibilities are limitless (even if they really aren't). In The Walking Dead, most of my choices were made with care for how the other survivors would be affected by them, with Clementine as the most important person, always. If you don't know, Clementine is the little girl that Lee is looking after. I chose based on what would be best for us in the group. In Spec Ops, however, I chose not based on how my squad would see me, but based on finding the best possible option in the worst possible situation. If there were no good options, I would try and make a better one. At one point early on in the game, things are already going really far downhill. It's clear that something has gone very, very wrong in Dubai. You were sent in to try and rescue people from the sandstorms, but the city has fallen apart and soldiers are ruling the streets with violence. Your goal is to reach their base of operations, but there is a small army between you and the gate. Suddenly you stumble across a grenade launcher loaded with white phosphorus. The only way to take the enemy out is to use chemical warfare. So I did. I powered up the drone and called out shots. I could see the soldiers just as white blobs in the IR camera, so I targeted them and released the chemicals. There was a huge cluster of them in one of the trenches, so I took the whole group out with one shot. When we were finished, we had to walk to the gate through the area we had just cleared. If you don't know what white phosphorus is, it is a chemical that when released, burns. It causes the flesh to melt away and people who are it by it to die agonizingly slowly. Walking down that road was horrible. The screams and moans of the soldiers as they writhed around in agony, dieing little by little. Seeing smoke rise from their charred bodies. But that wasn't the worst of it. No, that came when I reached the trench that the big group of soldiers was hiding in. You see, white phosphorus is heavier than air, so it collects in these low places. The people here were charred to a crisp. But as you walk into the trench, you come to an awful realization. The people hiding here weren't soldiers; they were civilians. As Cpt. Walker stares at the burned corpses of a mother and her child she is holding, the world around him slowly fades away. Cpt. Walker in shock after seeing what he (what I...) did. I have never felt as much like a monster as I did in that one moment. I was in shock. This was my doing, not Cpt. Walker's. I was directly responsible for the slaughter of 47 innocent lives, including children. It hurt. It still hurts. Writing this now, two months later, I'm actually tearing up as I remember the experience. And the worst part is that I chose to use the white phosphorus. I didn't even look for an alternative way around; I just hopped on the machine and burned the people alive. The choices in Spec Ops are all very organic. It isn't like The Walking Dead where you are presented with a "Press A, B, X, or Y to choose" scenario. Your actions are your choice. You can choose to fire into the crowd to disperse the riot, or you can try and find a less violent way. But the game won't tell you what to do. You have to figure it out for yourself. I love that about the game. Every choice is yours, through and through, because it was your idea. These games are standout examples of two radically different ways of implementing choice in games. In The Walking Dead, every choice feels like it matters, tailoring the game to you, and only you. In Spec Ops: The Line, you make all of the choices your own by coming up with them yourself, and then acting them out. The mechanics have a message behind them, and this only serves to improve the whole experience of the games. Please play these games. Who knows; you may even learn something about yourself!